Khwanjai’s recipe for Thai Chicken Soup is without doubt a very easy Chicken Soup Recipe that anyone can master. A Meal in itself! In the video, in typical Thai cooking style, we use a wok but that’s mainly to give you a better view. Turn on the heat put in water in pot bring to boil. 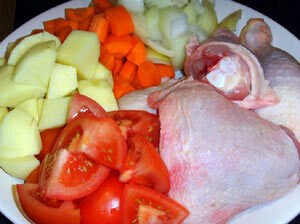 Once the broth starts to boil, turn down the heat and let it simmer at least 30-40 minutes to get the flavour. This one really is a meal in itself, having said that because it is mild, fresh and savoury flavoured, it goes great with something with a bit more bite, try our Pork Red Curry Stir Fry or perhaps another lovely authentic Thai recipe, Khwanjai’s very own, unique creation, Dry Chicken Red Curry. 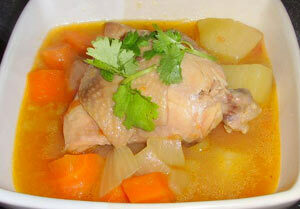 You may also like to try our Coconut Chicken Soup delicately sweet, sour and spicy. Have you printed off the recipe to make notes?